Years ago, Helen Couchman had a feeling that China was changing fast and she knew that she had to see it before it was too late. And so she did. 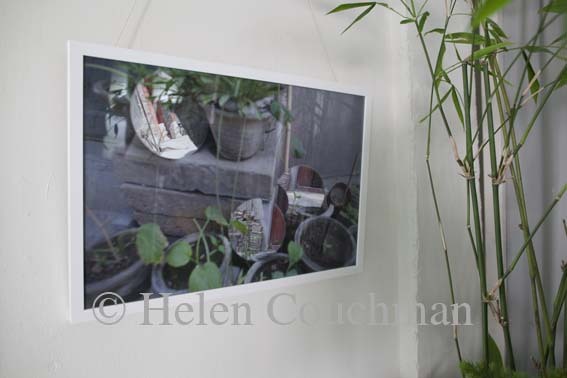 For the past six years, Helen has been exploring her own art, as well as China’s traditional arts, through her exploration of Beijing and its spaces. You mentioned that you knew you had to come to Beijing. How did your work evolve once you got here? I have always been interested in changing landscapes and how they reveal the politics and the economics of the place, even when there aren’t people in the image. I’ve worked on this reoccurring idea in Armenia, Cyprus, and the States. The reason I worked with fans in my first project was that I wanted to explore the idea of me going somewhere. 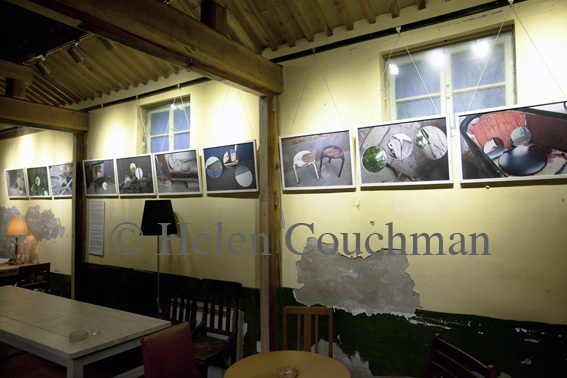 It was my first visit to Beijing and I had two months to prepare an exhibition of new work. I thought: “What is an artist doing, going to China to work?” I wanted to explore, and understand better how I’d deal with that. What was I to return to England with? Fans bear a historical significance, but are also easy to travel with, which fitted my self-made brief. Their tradition is to be a memento of something you’ve enjoyed, such as a landscape or a poem to a lover. These fans evolved to be a traveling memory in the form of a traditional and oriental gift. What impressed you most about Beijing when you first arrived? When I first arrived in Beijing, I would go out at night on my bicycle and take photos of huge advertising hoardings surrounding construction sites, particularly on the third ring road. I was impressed with the size of them. I took hundreds of photographs. I have a strong sense of the spacial qualities of my surroundings. You are the sum of all of your parts. It’s not that I go out for a walk in the park and the autumn leaves make me go home and paint autumn leaves. No, it’s that all of these things filter in, and if you keep focusing on certain interests, it comes out of you and your work. This is why buildings have been such a strong presence in my work. What about your series of “Woodcuts, Cloud Series and Yellow Lining”? What really attracted me to this craft was the way the clouds are connected, and how they end up forming their own landscape. 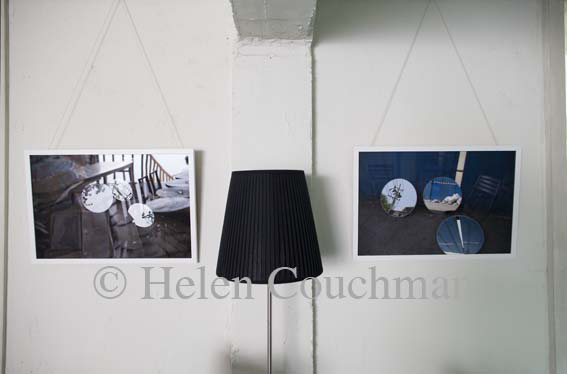 Then I placed things that I had noticed into the landscape – the advertising hoardings, satellite dishes, and the fans. They are all muddled together. The red paper, which is also used in the first project “Gift”, is called thousand year red paper and it’s so saturated with red ink that everything that touches it goes red. It’s a nightmare to work with, but the redness of it is glorious. It’s absolutely velvety, and soaked in color. In my later perfomative photographic series “Untitled (Collecting and Dropping)” I let my fingers become red having repeatedly handled this paper as my feet become black on the dusty floor. What about your book, WORKERS 工人. Where did the idea for that originate? In a nutshell, it was me looking at how the Olympics was such a particular time for this city, and the country. It seem to me that it was the first time the country had offered an open invitation to the world to come and see what China could do. I felt that it boiled down to a question of rebranding and who was involved in it. I decided to explore the site of the new Olympic park. The key thing that struck me was the power of the people, and the number of hands that China had, and the fact that everything can be moved around or shifted by these people. This is why I decided to put my focus on the workers. I wanted to explore who is involved in the rebranding and is that rebranding for an internal of external market? I told the workers that I would be there for two days, and that I would take a portrait of anyone who was willing, and that I would return to give them a print and to collect their names and names of their hometowns. In the end there were 143 people in the book. Looking at the portrait series there is an element of all 143 being alike – a symbolic worker – and yet they are individuals, which is revealed in their faces and their handwriting. It is also worth noting that hundreds, thousands, and tens of thousands of these migrant workers are working on things that their families might never see. Their relatives might have seen the Olympics on TV, but never have been able to afford a ticket, even if it had it been legal for them to do so. I like to imagine the portraits now pinned up in family homes across China. First in series of “Visualise’ Public Art Talks in Cambridge curated by Bronaċ Ferran. 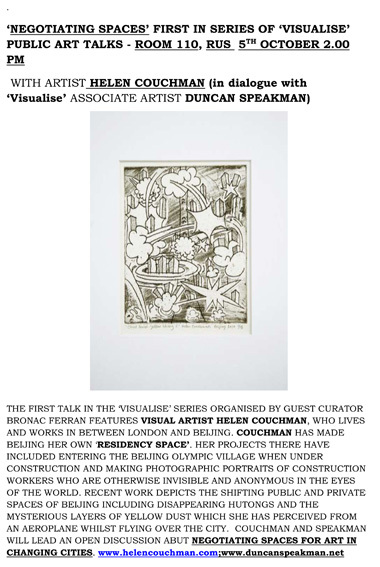 The first talk in the ‘Visualise’ series organised by guest curator Bronaċ Ferran features visual artist Helen Couchman, who lives and works between London and Beijing. Couchman has made Beijing her own ‘residency space’. 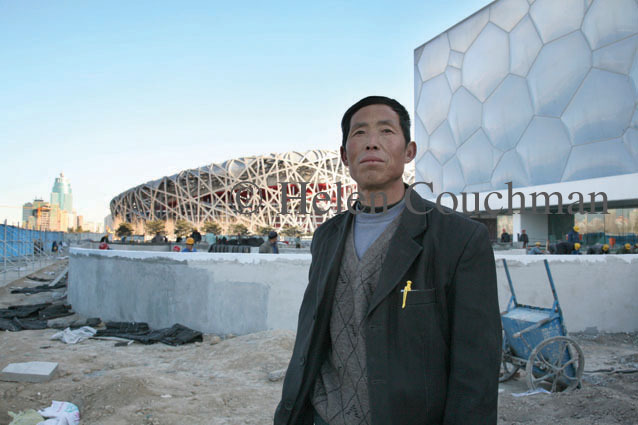 Her projects there have included entering the Beijing Olympic village when under construction and making photographic portraits of construction workers who are otherwise invisible and anonymous in the eyes of the world. Recent work depicts the shifting public and private spaces of Beijing including disappearing hutongs and the mysterious layers of yellow dust which she has perceived from an aeroplane whilst flying over the city. Couchman and Speakman will lead an open discussion about negotiating spaces for art in changing cities. The hutongs – or traditional lanes – of the Xicheng area surrounding Houhai Lake in downtown Beijing present a picture of a rapidly disappearing facet of city life. Filled with hidden courtyards and single-story houses, often dating back hundreds of years, walking among them reminds one of what Beijing used to be like, prior to the rapid modernization that has taken place in the last ten years, which has seen the erection of countless skyscrapers, high rise apartment buildings, and soulless American-style shopping centers. 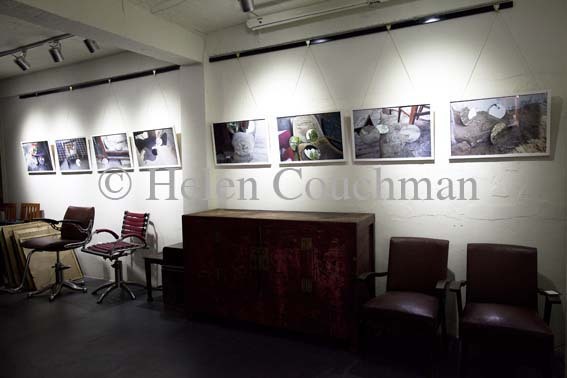 It is this world of “old Beijing,” which is constantly being threatened with extinction, that forms the setting for Helen Couchman’s latest series, In Beijing. The British artist, who has made Beijing her home since 2007, made the interesting choice of using three small mirrors in photographing seemingly random sites among the hutongs. 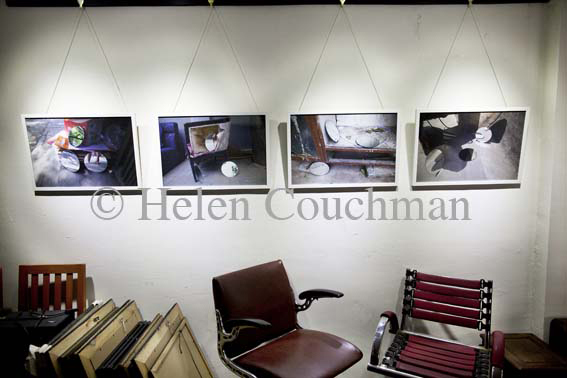 The ongoing series can be viewed as an extension of Couchman’s continual engagement with her adopted hometown, a process that first received international attention around the time of the Beijing Summer Olympics in 2008, in the form of her series of photographic portraits, Workers 工人 (gong ren). Travis Jeppesen: Maybe we can start with the Workers 工人 (gong ren) project. How did you gain access to the Olympic building site when they were working? Helen Couchman: I did contact people and hoped to get access in an official way, but no one replied. So I didn’t have any access. I just walked on site one day. More precisely, I had been walking around the premises for a couple of months every now and then. I’m interested in changing landscapes, and that’s one of the reasons why I came to Beijing. Normally, when I’m dealing with landscapes, there are no figures involved in the work. So I started by mostly photographing the site. But then one day, I was photographing two workers right by one of the gates, and they said, why don’t you come inside and have a look? And so I walked on site. They were at the point where it was no longer a massive hole in the ground, so it was relatively safe. Another workman further down asked if I would take his photograph. He didn’t have a camera, but was excited by the idea of having a photograph of himself working on the site. And so I came back to the site soon after that with a plan. I designated a certain time period; otherwise you can photograph people endlessly. I spread the word that I would wait there for two days and would photograph anyone who wanted to be photographed. I took pictures of 143 people in those two days. And I said I would come back with prints to give out. 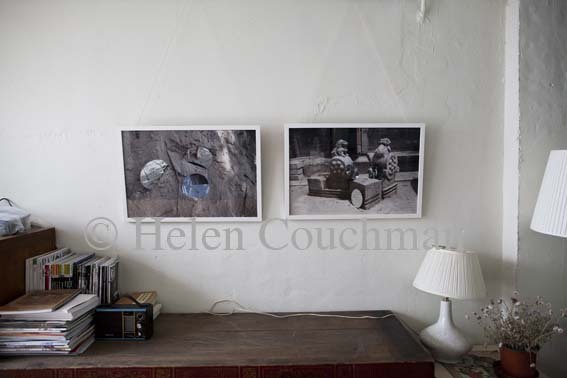 I printed them and gave any of the workers who managed to meet me again their photograph – because it was all unofficial, there was no chance of meeting anyone again outside of the project, so I waited in the place where the portraits were taken for two days with these prints. I told them, “I’ll return and wait for two days. 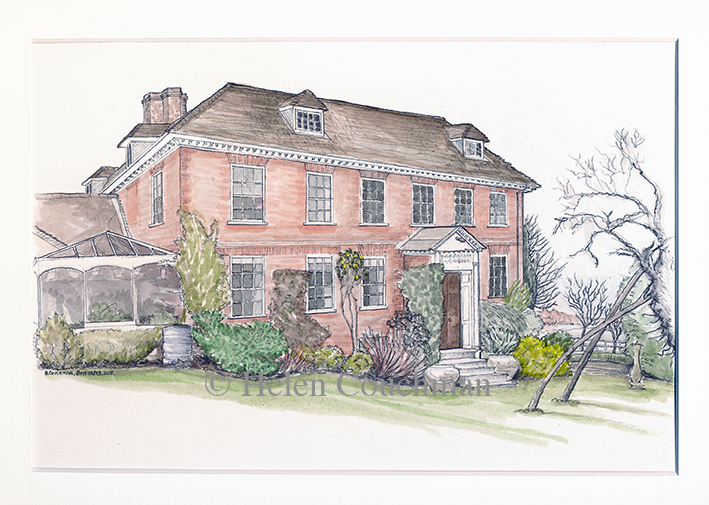 Come and find me and I’ll give you the print.” Then I asked them for their signature and their home address. I didn’t take any more photos on those days. A couple of people came up and asked me to take their picture later, and I had to say, “Sorry, I was here for two days and I decided before I started that I had to put a time limit on this project.” Looking through the book, you’ll see that some of the people are listed as unknown, and that’s when I didn’t meet the person again. I was sorry about that. But in a sense, it fits the project. Because the fact is with these situations, where large numbers of migrant workers build vast areas of construction in China, you never know who they were when you’re looking at the end product. I told them that I thought what they were doing was great work. Any foreigner who is familiar with Chinese building sites will tell you that it is a very hands-on process. At a western style construction site, you might have a guy with a crane, but at a Chinese construction site, instead you might have fifty guys pulling a rope. I’m interested in the changes that are happening in China and in this case, form whom this massive stadium, aquatic center and Olympic park were being built? These workers would not have the papers, called hukou, needed to return to Beijing during the Olympics or the money to buy tickets. They wouldn’t be back to see the building when it was finished. Jeppesen: It highlights the inherent anonymity of the situation. Couchman: Well, before the Olympics, there were especially large numbers of migrant workers coming through the city. You’d see them sitting at midday eating lunch, and they would be gathered in large groups sitting on the pavement. And you might wonder, where did all these people come from? Where are they sleeping tonight? What are they working on? Couchman: Yes, it was history. It was very important for the Chinese. Because they hyped it themselves as an invitation to the world to come and see what China could do. The hype was not coming from outside. They made a big deal of it. 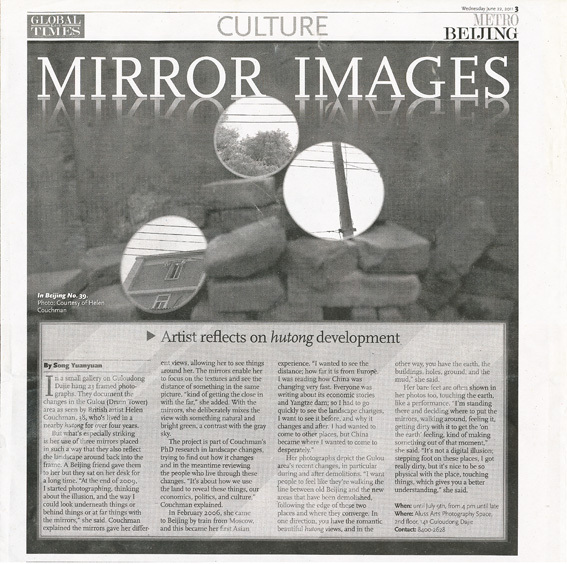 Jeppesen: Your latest project with the mirrors, what’s it called? Couchman: It’s an odd one. Usually a title comes to me early on. With this project, I had difficulty and I think there’s a reason why. My motives aren’t complicated, but there is a lot going on within the images. It’s a lot about found objects. It was hard defining, but I found that whenever I was talking about the project, I talked about an exhibition in Beijing. So I called it In Beijing. At first, I thought it was temporary, a working title. But finally, I think I might stick to it because it ties the series down to a certain location. And it becomes, again, about location. Jeppesen: It engages specifically with the topography of this neighborhood where you’re living in Beijing. I’m wondering what the genesis of the project was. Couchman: Usually I have a snippet of an idea and I brew on it for ages until it becomes urgent to do. I have had those three mirrors sitting on my desk since January 2009. I wanted from the beginning to capture nearness and distance in the same image. But then later on, the reason why the project became pressing was because I put the two problems together. I wonder how to interpret my surroundings, and in this case how the city’s changes can be interpreted. They recently demolished two large areas around the historic Drum and Bell Towers, and they [the government] had said that they were going to demolish another enormous area. Some locals were up in arms about it. So then they decided to curtail the plans, however they had already demolished two large areas to the north and south. I was sorry to see this had happened and that it seemed so inevitable. I live in the hutongs and have walked and cycled around them since I’ve lived in Beijing. I felt that there was something to be done with what I refer to as the edge – where you have the upturned, demolished earthy site, basically earth on one side and then the hutongs leading away undisturbed from that edge on your other side. I’d been taking pictures recording where they had demolished these neighborhoods and flattened the earth; where it was bare. I walked across it, watching workers, machinery, scavengers, and children digging into it. Bringing the cityscape quickly down to an earthy flatness is quite surreal. Removing all the stuff that makes a city, you are starkly reminded that underneath it is soil and nothing more. Jeppesen: Regarding the earthiness or even grittiness of the photos, it’s very Beijing, isn’t it? It also relates to the people, too. Beijingers are regarded as being very down-to-earth. Couchman: I think Beijing is a very earthy place. One of the reasons why I live here is because it is being dug up. Not everyone would make it a destination city – a place that’s being dug up! – but I definitely came here for that reason. Jeppesen: At what point did you decide to bring the mirrors into it? Couchman: The hutongs are complicated. Some people think they’re slums, some people think they’re beautiful, some think they’re historical treasures and should be protected by UNESCO. I think there are arguments that fit all those examples. I’m certainly a big fan of the hutongs. But it’s a wrestling match between something beautiful, something ugly, something really old, and then someone will stick a brand new door on it – it’s all mixed together, and in that respect, it has so much humanity. So I decided that nearness and distance play a role, as they helped me to define the “view” more definitely. With the mirrors, I can mix a green leafy tree behind me, further down the hutong, with a scruffy piece of plastic that’s covering someone’s woodpile. The mirrors can reflect those contradictions physically and allow me to place possibly contrary views of the place together within a single image. Jeppesen: It’s a lot more authentic than what you find on a postcard of Beijing. But in an extremely detailed way, which gives it aesthetic value. And it’s so abstract, because with the mirrors, you get several different images within a single image, almost producing a collage effect. I remember reading that there’s a superstitious aspect to the use of the mirrors, as well. Couchman: Yes. I didn’t know this when I began the project, but I thought there was likely to be a superstition or meaning with mirrors, and it turns out the Chinese do have this. I read that mirrors were considered to affect the flow of energy, wealth, and healthiness of a space, and had historically been placed outside houses in China to ward off negative forces. I use that myth in the text accompanying the work because it feels very apt, though it wasn’t fundamental to my making the project. Jeppesen: Would you say that photography is at the core of your practice? 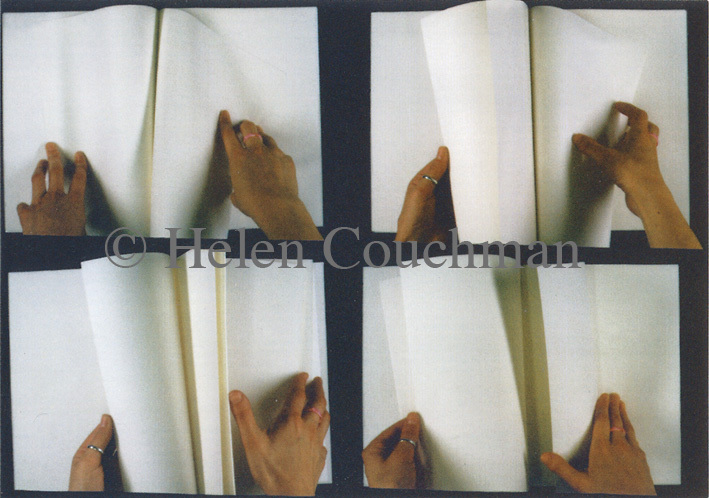 Couchman: Yes, I think photography is a medium, amongst drawing, printmaking, and installation, that I often use, but if you asked me where my instincts lie, I’d say sculpture. I’ve been taking pictures since I was a child. My grandfather gave me a plastic camera when I was eight or so. I always wanted to take pictures. But it has always felt more like note taking, rather than the final item. Now I use photos as my final pieces more often because a lot of my photography has become, not a document of an action, but often, part of that action. So, for example, in this particular series, it was important not to end up documenting the hutongs. I wanted the final images to be active. I think a lot of photography records something seen. This work does by default document aspects of the hutongs, but I imagine the feeling when you see the exhibition is that the pieces are about a particular process of doing something. A sense of place, of being there and getting dirty and dusty. Rather than more of a disconnection – the photographer has disappeared and the illusion is left. I wanted this series to be dirty, dusty, and physical. That’s why my feet are in some of the pictures. It’s about being right there on that physical texture. I wanted this to be remembered as well. It’s about walking around, feeling it, touching it, and playing with it. I think photography is sometimes still too much about illusion. In my practice currently, I think photographic illusion in the traditional sense is slightly irrelevant. Jeppesen: You’re trying for something direct and almost brutal. Couchman: Yes, there is that energy in this series, I think. With the Workers 工人 project, I think when you get right down to it, it’s about exchange. The photographs became items that were exchanged. And then they traveled. Exchange – that’s the key. Travis Jeppesen is the author of five books, including Victims, the novel chosen by Dennis Cooper to debut his “Little House on the Bowery” imprint for Akashic Books, and Disorientations: Art on the Margins of the “Contemporary”. 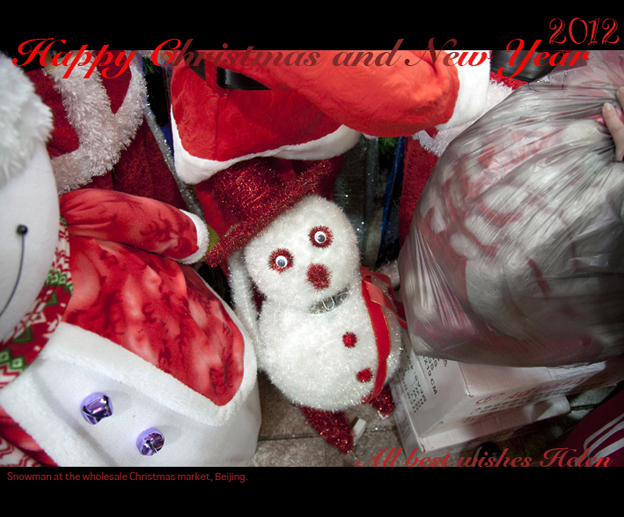 His most recent book is Dicklung & Others, a collection of poetry. He lives in Berlin. Recent exhibition In Beijing closed overnight last month due to unforeseen circumstances. 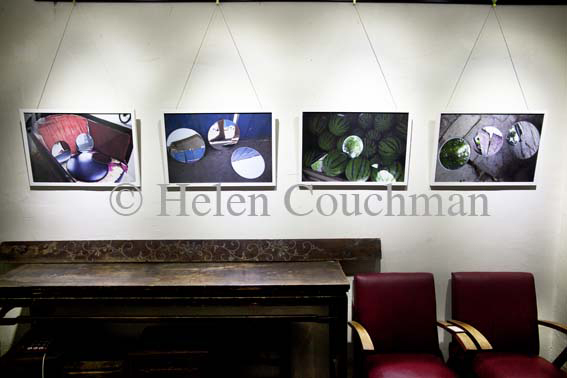 Because of its untimely closure a selection from the series is on show at Amilal until the 24th August. In a small gallery on Guloudong Dajie hang 23 framed photographs. 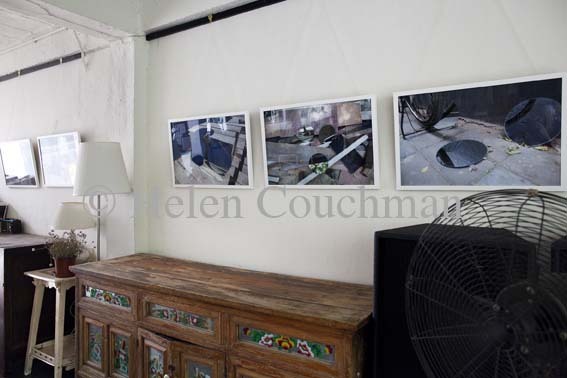 They document the changes in the Gulou (Drum Tower) area as seen by British artist Helen Couchman, 38, who’s lived in a nearby hutong for over four years. But what’s especially striking is her use of three mirrors placed in such a way that they also reflect the landscape around back into the frame. A Beijing friend gave them to her but they sat on her desk for a long time. “At the end of 2009, I started photographing, thinking about the illusion, and the way I could look underneath things or behind things or at far things with the mirrors,” she said. 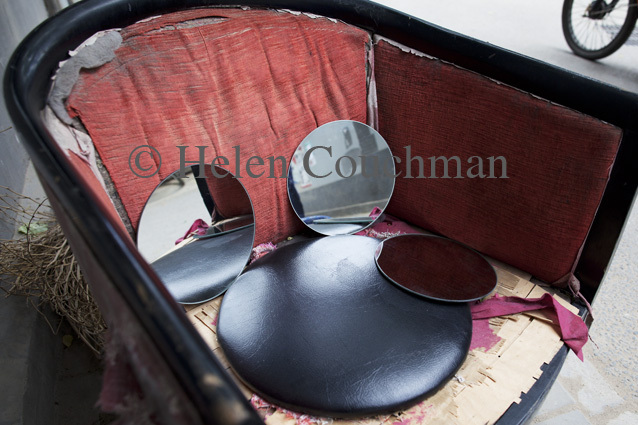 Couchman explained the mirrors gave her different views, allowing her to see things around her. The mirrors enable her to focus on the textures and see the distance of something in the same picture, “kind of getting the close in with the far,” she added. With the mirrors, she deliberately mixes the view with something natural and bright green, a contrast with the gray sky. The project is part of Couchman’s PhD research in landscape changes, trying to find out how it changes and in the meantime reviewing the people who live through these changes. “It’s about how we use the land to reveal these things, our economics, politics, and culture,” Couchman explained. 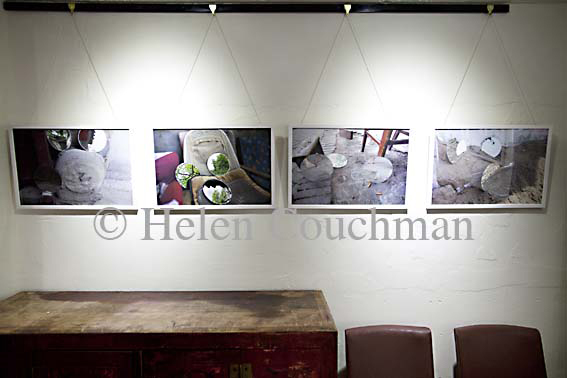 Her photographs depict the Gulou area’s recent changes, in particular during and after demolitions. “I want people to feel like they’re walking the line between old Beijing and the new areas that have been demolished, following the edge of these two places and where they converge. In one direction, you have the romantic beautiful hutong views, and in the other way, you have the earth, the buildings, holes, ground, and the mud,” she said. Her bare feet are often shown in her photos too, touching the earth, like a performance. “I’m standing there and deciding where to put the mirrors, walking around, feeling it, getting dirty with it to get the ‘on the earth’ feeling, kind of making something out of that moment,” she said. “It’s not a digital illusion; stepping foot on these places, I got really dirty, but it’s nice to be so physical with the place, touching things, which gives you a better understanding,” she said.